With a focus on Family Centered Care, our new facility includes larger, ergonomic patient rooms that allow space for the patient care team and family members. 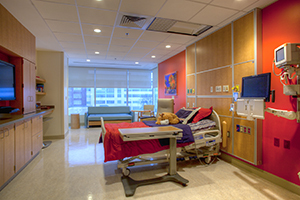 The Samuelson Children's Hospital features 26 private inpatient rooms. Each inpatient room is equipped with a video game system, 42" flat screen television, a sleeper sofa bed for parents, storage with a combination lock and a small table for paperwork, homework or playing games. 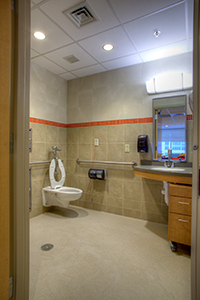 Each room includes a full bathroom with a shower, child seat and a removable shower head for smaller children. Computers are located in each room for staff documentation. The rooms are spacious with windows and lots of natural light. 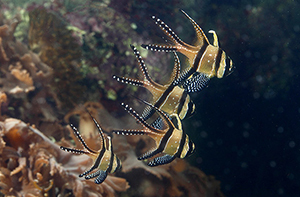 At the Herman & Walter Samuelson Children's Hospital at Sinai, kids receiving care may enjoy the life under the sea! LifeBridge Health has partnered with the National Aquarium in Baltimore to broadcast a live feed in every patient room. This is possible through the internal cable system in patient rooms. This live broadcast is also available in the 3rd floor lobby for all visitors to enjoy. The broadcast is available every day from 8:00 a.m. - 8:00 p.m.